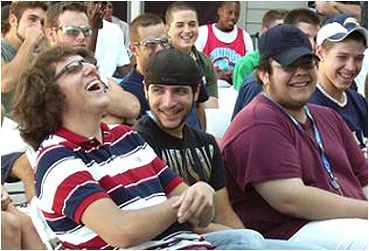 Middle School Assemblies that are Educational, Motivational, Interactive, and FUN For Your Middle School Students!! I still remember how confusing middle school was. While many people talk most about high school being the most challenging time of their lives, I’m willing to bet most people, if pressed, would say middle school was actually more of a challenge. Kids in middle school are at an awkward time: they still have one foot firmly planted in childhood but they are also racing towards high school. While everyone talks about their bodies changing, the reality of it is their brains are changing, too, and it can be such a scary, confusing time. I mention all of this up front because I know what you’re thinking. Most of the pictures and videos on this website look WAY too childish for middle schoolers!” You’re right! 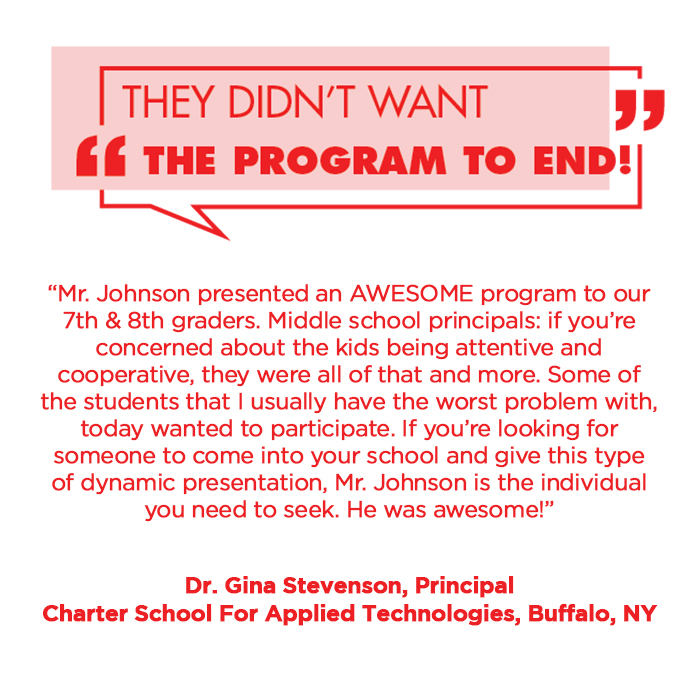 For that reason, I have created different versions of most of my assembly programs specifically for middle school students! That means you can rest assured that if you bring my Bullying assembly program to your school, that not only are the lessons on their age level but also too is the magic and fun I present. There’s nothing worse than watching an assembly presenter present the exact same program to middle schoolers as to the primary grades. 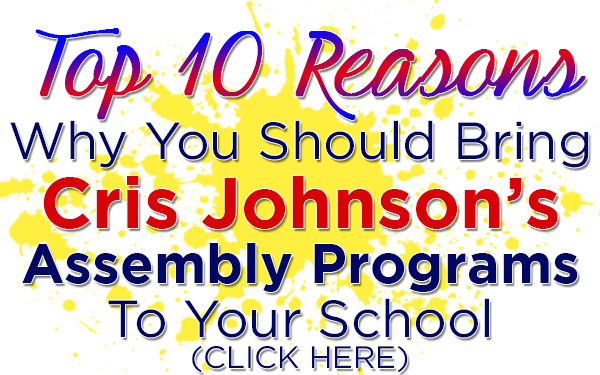 For that reason, I absolutely refuse to present one program to grades K-8 in one assembly. I feel so strongly that my policy is to offer you the second assembly on the same day back to back absolutely free – that way, you can rest assured that for the same investment, you’re guaranteeing an enriching assembly experience that both groups will enjoy and appreciate! 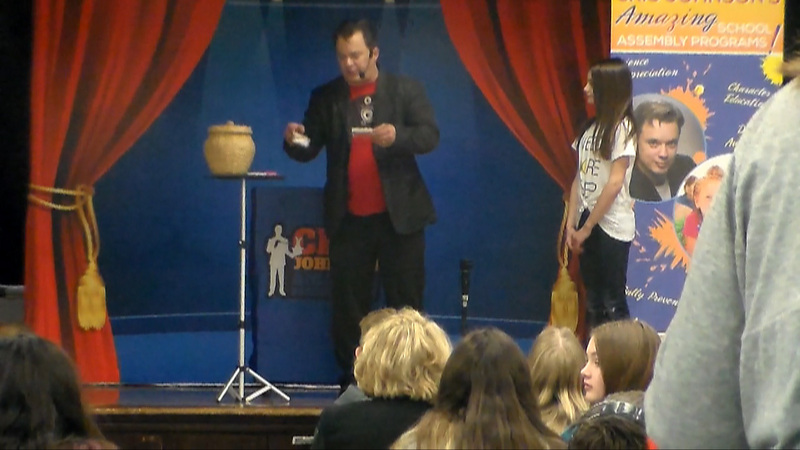 I know how to walk the line, entertaining the kids with fun and amazing magic on their developmental level while motivating and educating them in a manner that is fast-paced, energetic, interactive, and frequently hilarious! 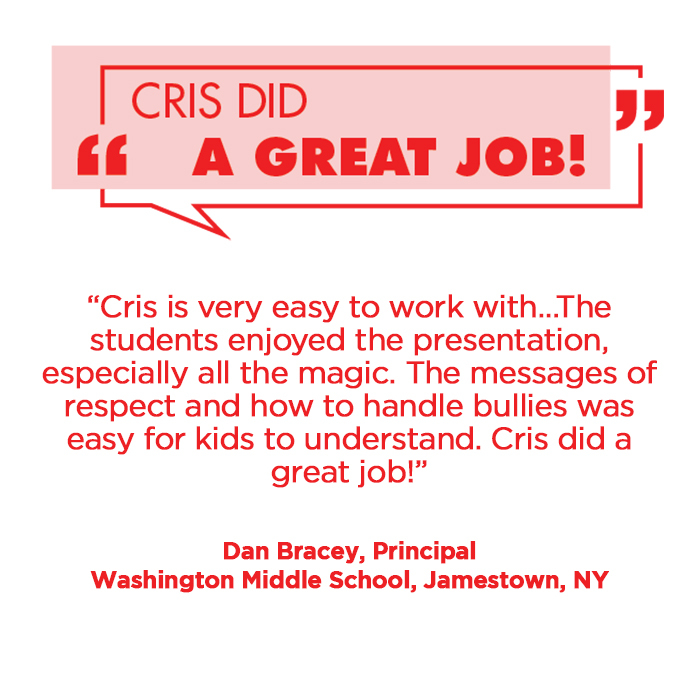 Each of my middle school assemblies provide key information to aid students in dealing with critical issues such as bullying, character development, drug awareness, and even their own perceptions. 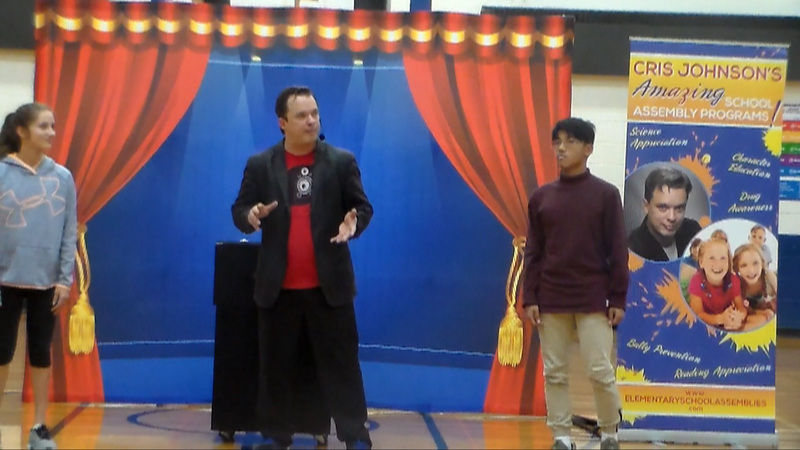 In addition, I’ve created several fun, curriculum-based assemblies on topics such as science and math. 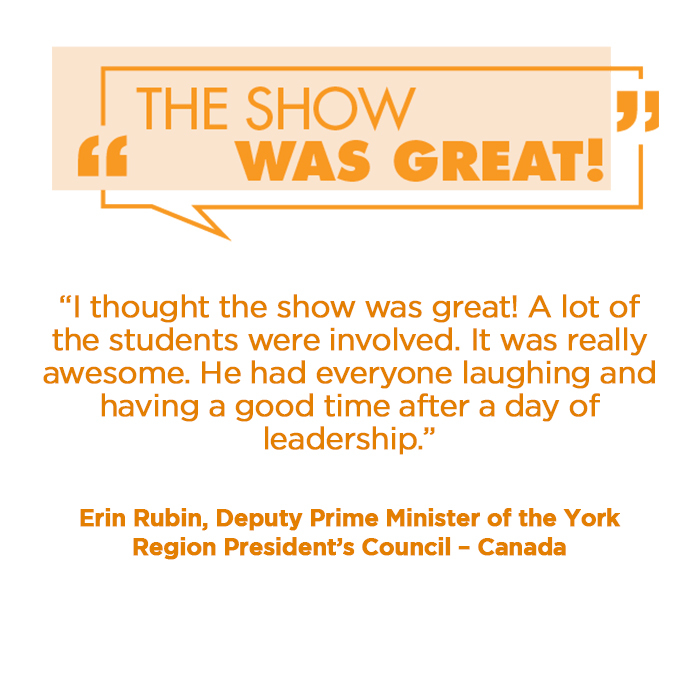 All of my programs use a ton of audience participation to get as many students involved as possible and I will even have several students join me on stage. 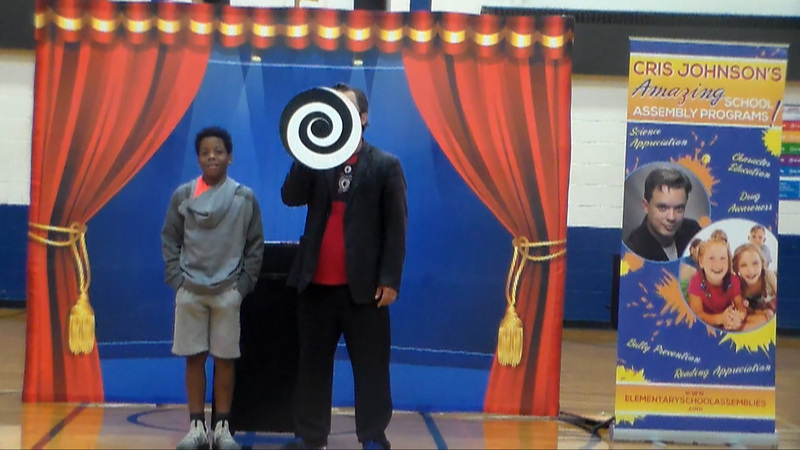 While with me onstage, your students will have a blast – whether they are participating in fun mind reading experiments with their teachers, or jumping in surprise when a trained ‘snake’ jumps out of a basket to find their selected playing card, or working with other students onstage to stay ‘suspended’ in the air with a crazy science experiment, you can rest assured knowing your students won’t just participate…they’ll be jumping out of their seats because they are so eager to help! Here’s the deal: you have, by my precise calculation…about a zillion assembly choices you can find online. I’m not the most famous, not by a long shot, but after 20 years ion the business, I know what works and what DOESN’T work for middle schoolers. Therefforetruly believes in the quality of his programs. Call Cris Johnson TODAY to reserve your date! I book 200 – 250 shows per year.